This thread is actually very informative! I see the difference in Soshu and can even see that the swords from early mainline Soshu are harder and perhaps more rigid in construction. I also wonder if BoHi exist more in Soshu than Bizen and if so why considering their already rigid structures. I absolutely agree about ko-Bizen and ko-Ichimonji which is why I didn't mention them, perhaps I should have been more specific. The point really was that I felt the Rai school was being criticised for being promoted as high end while they produced in quantity and used a softer steel core and they were somehow inferior or dishonest in their approach. Ichimonji schools followed by other Bizen schools produced more swords than any other school. They also used multiple piece construction. I was curious as to why this would be acceptable for the most successful and some would argue most showy school but not for one that was more subtle. BTW I have also studied a number of Bizen swords that I would without doubt love to include in a collection. However my preference in Bizen work has so far been ko-Bizen, ko-Ichimonji and then earlier Osafune work especially Nagamitsu. All, as you say, exhibit nie to a greater or lesser extent. As always it boils down to personal preferences. Maybe Chris is not a Rai person? Some of the criticisms for Rai were about thin skin and superficial beauty, which you do not have with Bizen. There is no sumihada and unsightly patches that sometimes can be seen in Rai or Hizen. The argument about mass production - well, successful schools had to deal with demand. The Osafune school was so successful that indeed they had a great number of master smiths signing on behalf of Nagamitsu probably (it is a less documented process but is mentioned in some of the books). What is less glamorous and definitely less good is the mass “Sukesada” production (excepting Yosozaemon and one other) and mass Mino production. But these two later offshoots had to satisfy the constant war driven demand for blades and did not have time for perfection. Bizen and Rai don't provide a good comparison to each other. Bizen is a tradition represented by a broad set of schools, with a lot of between-school variations within the Bizen both horizontally (between schools active at the same time) and vertically (expressed at different time points). Personally, I love the work of the Osafune branch and how they took in some Soshu influence with Kanemitsu, and generally the Chogi offshoot and its Soden-Bizen style which I find very attractive. A more apt comparison would be so say that 'Ichi' is to Bizen what 'Rai' is to Yamashiro. A brand name for a fashionable product, where the maker's name was eclipsed in favour a singular brand to carry a reputation. More generally we find this across the world in swordmaking - for instance 'Assad Allah' blades in the Middle East or 'Ulfberg' in the northern countries. Interesting phenomena in itself, and perhaps one of the earliest example of branding known to mankind. Hitatsura is the late Soshu death rattle. Darcy's theory is that raw materials ran out and this led the later Soshu generations to experiment with Hitatsura. In The idea is that it was a novelty to make up for the loss of primary materials which allowed better work to be made. Once hitatsura starts to kick in we very seldomly see good Soshu work anymore, and then it vanished into oblivion. I think its fair to say that Hitatsura was not successful but its also fair to point out that these Soshu guys were endlessly innovative. The main difference being that Rai is not an improvement on Sanji, Gojo, Awataguchi, while Ichimonji is an improvement on ko-Ichimonji. But again, the comparison is not appropriate as you have Fukuoka Ichi, Yoshioka Ichi, Kamakura Ichi, Katayama Ichi, etc etc, with differing degrees of nie / nioi forging and different degrees of flamboyance. Some Katayama Ichimonji are confused for Aoe, some of the Kamakura Ichi have a lot of nie. So, I am afraid the Bizen school has something for everyone - those who are obsessed with nie and hada and those who like flamboyant hamon. You just need to pick the school and period. So as not to focus exclusively on swords (Michael has converted me and the next time I can afford a really good sword,(( in my dreams)) I will know where to focus) can I follow up on John's Soten posting. I have sympathy for his point of view but if looking at Tsuba that I just fail to undertand the standout group are Yagyu. 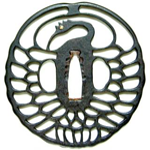 I am a great fan of Irin sukashi tsuba. I was abslutely overwhelmed by the stunning examples on show at Samurai art Expo of Higo, Owari, Akasaka et al. They were absolutely fantastic. And then there were some Yagyu pieces which in comparison looked poorly designed, flat, poorly cast and sandy. In fact they looked like every other Yagyu tsuba I have seen. So I appreciate beauty is in the eye of the beholder and as I understand it Yagyu is about design and not specific to a particular school but given they all look like poorly cast bits of poor quality iron could someone tell me what the real appeal is because to be honest I am really missing it. That's a good observation Michael, Rai was not an improvement over the top work that came before for the Buge market. Whereas Ichi is a step above it's Ko-variants and it branches out over time and space in multiple sub-groups with their own take. More broadly I find this to be a very interesting point: peaks, improvements, stagnation and descent and transformation in traditions. Soshu for me is fascinating because it's so amorphous: starts out near-peak Awataguchi with Shintogo, transitions in Yukimitsu, peaks Soshu with Masamune an takes on a completely different style 'rustic' style with Norishige who was presumably after Ko-Hoki, then spreads across the country with his students while the mainline faded away. It doesn't look to me like 'Soshu' applied to the smiths in this lineage really capture their very heterogeneous work. Soshu was more of an event in time which led to crazy experimentation and fundamental shifts in style using new materials, and then got synthesised back into the main traditions as Soden-Bizen, Naoe-Shizu etc. I think Soshu desrves a lot more study. Unfortunately pieces to study are few and far between. I mentioned in the Gokaden article that their flame burned very bright for a very short period. I am a great admirer of early Soshu work but much that I find to admire in these pieces rapidly dissappears in later generations By the time you get to Hitatsura and the course over activity of the later smiths from a personal point of view they have truly lost appeal. The balance of the ealry work that brought together the massive amount of activity on a firm ko-itame base has disappeared. If this is, as has been suggested, due to a material supply problem or whether the later smiths lacked the talent and over compensated I have no idea. They undoubtedly faced increased competition as other schools emulated their work but as I understand it the true death knell came when the Shogun relocated to Kyoto. taking away their prime market. It has been really nice to read differing opinions. As we are discussing the artistic side of things the can be a lot of difference in opinions yet nobody will be totally wrong. My own unpopular opinion is not towards specific school but high/very high class mumei blades in general. Yes I know that lot of them are simply amazing but I still don't totally get it even though I somewhat understand basics behind attributions and valuations. In my own personal opinion signed swords in worse condition should be appreciated more than mumei swords in better condition, yes there is a cut off point where mumei sword is simply just very important piece of history and reference of worksmanship and in such state it will override poor quality swords with mei. I think in general one thing that makes me like Bizen so much is because they have so many signed & dated swords remaining, and same thing is making my head blow as in Sōshū after Shintogo finding a signed sword from Yukimitsu, Masamune, Sadamune is a rare occurance. Then you get to Hiromitsu and Akihiro from whom lots of signed and dated swords are still remaining. So you can get quite accurate information from signed and dated Shintogo swords as well as from Hiromitsu and Akihiro but there is just a huge gap when allegedly "the best" swordsmith in history of Japan worked. So far only signed above tanto length sword from this trio I've found is the Meitō wakizashi Torii Masamune. I'd be more than happy to find signed tachi by any of this trio so please point me towards one if you happen to know one. That's an interesting take Jussi. I'd like to try and break down why you value Mei. If it's 2, then you'd agree that a Yamato Mei (Work is difficult to attribute to specific smiths) would be far more valuable to you than a Norishige mei (work is very recognizable). But broadly speaking, how do you weight these five different factors? I think it is impossible to disassociate the smith (and the quality, reputation etc embedded therein) from the mere presence of the mei. So, while indeed your categories 2 and 3 above are at least to me the most important reason for the preference for a mei, it is difficult to say that an Yamato mei will be more valuable than a Norishige mei (or even mumei Norishige ). Perhaps the presence of a Yamato mei might be much more significant to determine the exact manufacture but in relative value terms that is not true. But I am almost sure you were talking about the presence of the mei per se. I think I am in same boat as Michael that I see your options 2 and 3 being the most important ones in that list. Lots of signed swords have gone through some form of shortening and alteration but I still think they are very important reference pieces. Sometimes I find it funny how the remaining few last cm's of nakago that bear the two character signature mean the world to me. Rarity depends so much about the smith/school. Like above Kunitoshi, smiths like Nagamitsu, Nobukuni etc. have still lots of signed works as references where as some schools/smiths have only few remaining signed pieces. On that occasion even though for example by artistic merits a signed Nagamitsu tachi would be more valued than signed tachi by Bungo Tomoyuki, I think due to rarity factor I'd value the Tomoyuki over just another Jūyō Nagamitsu. I just picked Nagamitsu as the example as so far I have listed 63 signed tachi by him and I know the number will still go up a lot. And for comparison I yet know only 1 signed & dated tachi by Bungo Tomoyuki. For Norishige I would value signed tachi a lot as they are rare by him but he has many signed tanto so the rarity factor on those goes down. And I agree that Norishige style work is easier to identify compared to Yamato differences and mumei swords that have strong characteristics of that (Norishige) style have lot smaller "bin" of possible schools & smiths. As we are talking about Yamato, one thing I've noticed as I'm going through Nado Zufus is that NBTHK loves Taima. The amount of mumei Taima passing Jūyō and Tokubetsu Jūyō is big considering how rare Taima swords are in general. I think for suriage mumei swords Taima and Hoshō (Just a personal observation) are considered as the top tier Yamato attributions and both are rare. My own general favorite in Yamato is Senjuin, and their signed swords have great value by Japanese authorities but when it comes to suriage mumei their range is broad. Yes there are many mumei Senjuin that are Jūyō but there are also lot below that. A favorable attribution for mumei sword is Ryūmon Nobuyoshi as that attribution for mumei sword points it towards Jūyō. For Tegai there is Kanenaga, and for Shikkake there is Norinaga but in general I think Tegai & Shikkake are being the "weaker" Yamato attributions. Of course swords should be judged as one of a kind items but the above is just general trend that seems to be (or at least it was as I've been focusing on older attributions) popular by NBTHK. We should also be aware that NBTHK is also changing all the time, and as with mumei swords they are just opinions (although perhaps the best one). What they thought in the 1960's-70's-80's might be different as we are approaching 2020. Another mumei bunch that grinds my gears is Yamato Shizu - Shizu - Naoe Shizu... I'll need to learn to really understand mumei swords but it is a slow process. As 80% of my collection is koto O-suriage and mumei I think we inhabit oppostie ends of the collecting spectrum. picking up on your Yamato points I think Taima is favoured because frankly they were extremely good. I have seen three Taima blades all of which were/are stunning. The only fault I could find was that they weren't mine! I would also add ko-Senjuin to that mix having seen just one beautiful piece attributed to that school and era. I am a little confused regarding Shikkake. I remember reading in one of Tanobe Sesei's articles something to the effect "when we see an obviously Yamato naginata we often attribute it to Shikkake" I took this to mean they produced more naginata than others. Generally early Shikkake work seems highly regarded and as with so much else later generations less so. Tegai being the most prolific and longest lasting seems to encompass a much wider range of features and styles. looking at these as art (which I do) I don't think there is any comparison between a bungo sword and Nagamitsu in terms of quality or aesthetic appeal. I agree that Taima work is generally very good and that is the reason why they achieve the high tier papers. Wouldn't mind having one in my collection. I think in general for mumei swords you can go "quality first" if you can word it like that. The quality of the sword needs to be very high for Jūyō and extremely high for Tokubetsu Jūyō. Where as due to historical & rarity factor signed swords can be allowed more leeway in their condition and quality. Even though it might have sounded funny I didn't mean average Takada swords with the comparison to Nagamitsu, as the signed & dated Tomoyuki tachi is to my understanding Jūyō Bijutsuhin. There are tons of signed Muromachi Takada swords that are historically quite insignificant and there are even multiple signed and dated short swords by Tomoyuki so they are not as rare in comparison. Same logic could be used for other smiths/schools where signed tachi are rare. Like signed Enju tachi in general are really important, as are signed Yamato tachi (pre-Muromachi). But as you said Paul we should try to appreciate swords as whole and try to enjoy the good things on them, be it extremely beautiful jihada or shape that has been preserved nearly original for really long time. Some swords just have more good things than others which elevates them above the rest (talking about high quality items here).